For most people the name "kava" refers to both the plant known by botanists as piper methysticum ("intoxicating pepper") and the relaxing beverage made from its rootstock. We also use this word synonymously to refer to both. In this section you can learn some basic facts about both the plant - its main characteristics, types and key issues that should be of concern to anyone who wants to consume kava. If you need more information or have any questions, check out our Frequently Asked Questions or Contact Us. Piper methysticum belongs to the pepper family Piperaceae (just like the black pepper you use in your kitchen). It is a shrub that is propagated vegetatively (just like many other South Pacific crops). According to Dr Vincent Lebot, the most reliable available evidence suggests that kava originates from the islands of Melanesia (most likely modern-day Vanuatu) from where it has spread around the Pacific. There are hundreds of different kava cultivars with not only different requirements for growing, but also with distinct appearances, psychoactive properties and even flavours. The remarkable medicinal properties and soothing effects of kava have been part of the wisdom of Pacific islanders for centuries. Melanesians, Polynesians and Micronesian people alike grind the fresh or dry roots of this plant to prepare their traditional beverage, which is the centerpiece for much solemn ritual as well as being the daily social drink for many appreciative Oceanians. The specific effects of kava depend on the cultivar, plant's potency and method of consumption. But generally speaking, kava is known as a relaxing drink with potential to promote a sense of sociability, as well as feelings of peace and harmony without diminishing mental awareness or clarity. For many users, kava is a pleasant, refreshing and mentally uplifting drink that relieves fatigue, relaxes the body after hard work or effort, clears the mind and brings a sense of well-being. Kava makes you quiet and able to think and listen to your thoughts. Your mind opens to what has been and should be done. The subjective feeling after kava is to be slowed down, for it almost forces one to become quiet. Sometimes it is like entering a light relaxed dream. (...) The altered state of consciousness is subtle and mild. Noise, interference with thought processes, bright lights, movement, all hinder the effect, the mildly altered stream of thought. The subtle effect is maintained only if there is peace and quiet. Even though kava has been an important component of the traditional Pacific Islands medicine (with its potential anti-anxiety, stress relieving properties are under current scientific research), most people consume it today as a traditional, relaxing and refreshing beverage and not a remedy for any health problems. This is also how we see, consume and promote kava. One way to look at kava is to compare it to drinking coffee. Both kava and coffee are used as benign social drinks. While the latter can give a mild buzz and "kick" of energy, the former is known as a gently relaxing tonic. A mature kava plant. Only the parts of kava below where the hand points should be used for consumption. With the exception of knuckles used for growing more kava, all parts of the plant above the hand (i.e. the "aerial parts") should be discarded as they contain mildly toxic alkaloids. Unfortunately, some kava producers or distributors feel tempted to mix aerial parts of the plant with the roots in order to make extra money. This is one of the reasons why it is so important to only buy kava from trustworthy and reliable sources. The main active ingredients in kava responsible for its psychoactive and medicinal qualities are known as kavalactones and are concentrated in the plant's rootstock and roots. 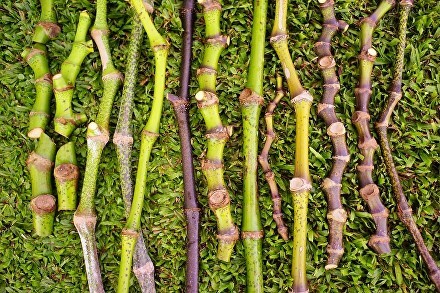 Different kava cultivars naturally display different compositions and concentrations of kavalactones (the latter can be increased with proper cultivation methods). The kavalactone composition can be expressed through the so-called kava chemotype. As each of the major kavalactone is responsible for different types of effects, it is quite important to pay attention to the kava chemotype. Kava chemotype is a six digit number that lists in decreasing order the relative amounts of kavalactones found (on average) in a particular kava. For example, the chemotype "465213" means that 4 (Kavain) is the most prominent kavalactone found in this plant. The next one 6 (Methysticin) is found in this plant but to a lesser degree than 4 (Kavain). Knowing the chemotype informs you about the relative concentrations of kavalatones, though it does not provide any info on the actual concentration of specific kavalactones or the overall potency of your beverage. The chemotype alone is not a perfect indicator of the effects (as noted by Garry Stoner: "a proper effects descriptor would take into account the interaction of kavalactones as wells as their relative percentages, and much more research must be done before this will be possible"), but knowing the chemotype can nevertheless help people to make a better informed decision about the kind of kava they buy and drink. For instance, kavas with higher proportions of kavain (i.e. those with chemotypes with number 4 in the first or second position) and dihydrokavain (number 2) are generally considered as the most desirable kavas. They tend produce more "heady", uplifting and cerebral effects. Such kavas can often good for day-time drinking as they are thought to keep the mind relaxed and yet alert alert, refreshed and relieved of mental fatigue. They are known to promote a gentle sense of well-being, contentment and happy unconcern. Such kavas can also be good for social gatherings and parties as, when prepared at low to moderate strength, encourage conversations and camaraderie. When consumed in more potent forms they often prove more euphoric and encourage “listening to the kava”, i.e. the pleasant state of meditative contemplation and joyful revisiting of old memories. While chemotype is not the only factor affecting kava's taste, many heady kavas are known to have a relatively mild taste. By contrast, kavas with higher concentrations of the more more lipophilic kavalactones, i.e. dihydromethysticin (number 5) and, to a much lesser degree, yangonin (3) and demethoxy-yangonin (1), are considered as"heavier" and generally less desirable kavas. In particular, kavas with a very high (both absolute and relative) concentration of dihydromethysticin (5) are considered to be inferior due to their potential for causing hangovers and nausea. Indeed, one of the key characteristic features of non-noble kava cultivars is that they posses extremely high amounts of dihydromethysticin. Noble cultivars with higher amounts of dihydromethysticin (and, to some degree, other of the more lipophilic kavalactones) are not necessarily seen as undesirable, but they are thought of as more suitable for those who prefer more sedating, longer-lasting, “body-melting” and less euphoric effects. As such these kavas are not ideal for social interactions, clear contemplation or day-time drinking. Heavy kavas are also known for having a noticeably more bitter or peppery taste than the heady varieties. Kava's lateral root. The star-like pattern is created by hard fibres. The soft starch contianing kavalactones is in between the hard fibres. Generally speaking, kava reaches its maximum kavalactone content within 18-36 months of planting. Beyond this age it doesn't increase in potency, but many good farmers like to keep it in the ground for longer to increase its mass. Some farmers, eager to make quick money or following a natural disaster, harvest their plants prematurely which means that their kava is likely to be very weak (and likely cheap). Lateral roots are the most potent part of the plant and hence kava powders containing higher ratios of these roots tend to be in higher demand (and more expensive). Note that with extra strength comes extra bitterness as the stump has a much milder taste than these lateral roots. It is also important to store your kava properly (ideally vacuum-sealed or at the very least in an air-tight container) as kava can lose its potency fairly rapidly when it's exposed to air and moisture. Other things being equal, the fresher the kava the stronger it is. This, in addition to such factors as the loss of kavalactones due to drying, explains why freshly harvested (green) kava consumed in Vanuatu is famous for its strength. While knowing kava's chemotype and concentration of kavalactones is both useful and important, kava drinkers should pay even more attention to their products' purity and nobility. Read our article about Kava's Purity, the Tudei Kava Controversy and Kava Testing to learn more! Disclaimer: We are not medical professionals. The information provided on this website is not meant to be used to diagnose, treat, cure, or prevent any disease. What we present here is the literature we are familiar with and our own experiences related to the consumption of kava as a traditional beverage. If you do suffer from an illness, take any medications, require treatment, or have any other concerns, we advise that you consult your GP whether you can safely use kava.